Welcome to the exclusive, gated, oceanfront paradise known as Hali'i Kai at Waikoloa Beach Resort, located on the Big Island of Hawaii. 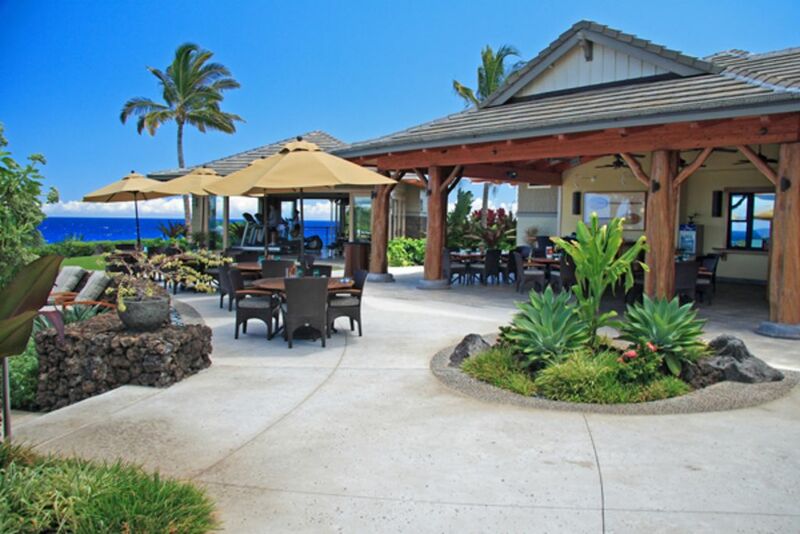 Be one of the first to enjoy the finest private resort in Hawaii along the shore of the Kohala Gold Coast. This exclusive retreat offers many amenities as you enjoy a panoramic view of the ocean, volcanoes and golf course. Sip a Mai Tai by the ocean while watching whales jump and play during season with the island of Maui as a backdrop. The Oceanside Club House offers a first class fitness center, open air cabana restaurant and accommodations for barbecues. Experience the serenity of the cascading waterfall of the lagoon style pool or relax in the lava rock spa complete with a sand bottom. A separate pool is available for the children. You may take a stroll through the hammock equipped and lush tropical landscape of the resort or enjoy the Polynesian atmosphere of the world renown Hilton Waikoloa Resort Hotel and adjacent Robert Trent Jones designed 18 hole golf course. This new villa has a breathtaking view of the surrounding volcanoes, golf course, ocean, and sunsets from the lanai. From the spacious living room, to the oversized baths, you are greeted with a tropical feeling of Hawaii the minute you walk in the door. The elegant decor is accented with many teakwood pieces throughout the home. The gourmet kitchen offers state of the art appliances, formal dining for four, and 3 counter stools. The living room has an HD flat screen TV with over 70 channels and a Blue Ray/DVD player. The sectional sofa has a pull out bed that will sleep two. The master suite boasts a California Kiing bed and stunning views of the golf course. The oversized master bath has a large walk-in shower and a separate deep bathtub for soaking. The second bedroom has two single beds that can also be made up as king upon request. For your convenience, each bedroom is equipped with a HD flat screen TV, DVD player and cable. The home offers free high-speed internet access. Though you may want to spend all your time relaxing in the villa or enjoying the ambiance of the resort, you are just minutes away from the best the Big Island has to offer. The adjacent Hilton features six restaurants, the famous Kohala Spa, white sand beaches of Anaeho-omalu Bay and swimming with dolphins. You are within walking distant of the King's Place and Queen's Place shops which carry an assortment of fine dining including nationally renown Roy's steak house and Merriman Cafe. King's Place boasts exclusive high-end boutiques, art galleries and everything from unique one of a kind jewelry shops to Tiffany & Co. You are just twenty minutes from the Kona Airport and seven miles from the quaint village of Waikoloa. Among the activities on the Big Island, you can choose from walking down ancient Petroglyph sacred trails, horseback riding, biking, volcano crater hiking, diving, snorkeling, exploring tropical rainforest, sport fishing, tennis. For the young and young at heart, Kona Beach and Anaehoomalu beach offer volleyball and open air pubs (Lava Lava) for viewing sunsets. We hope you will discover the magnificent and relaxing lifestyle of Hali'i Kai at Waikoloa Beach Resort. This native Hawaiian blessed resort will give everlasting memories of the HOME we love. SMOKING WITHIN HALII KAI IS ONLY PERMITTED IN DESIGNATED AREAS. NO SMOKING IT ALLOWED IN UNITS, ON LANAIS, OR ON BALCONIES. * The condo was very well equipped, especially the kitchen. It even had a rice maker! * The internet was fast and reliable. * The condo was decorated and furnished very nicely. It was very, very clean. * The view from the patio is great - you get ocean, volcano and golf course. * The washer and dryer were great to have. * The rental management staff were very nice and helpful. * If you are attending a conference at a nearby hotel, this condo is a great place to stay. As during our previous visits to Hali Kai 3D, the unit was clean, updated, and well equipped. The property manager was very helpful and quickly resolved a small issue we had upon arrival. It is a bit of a walk to the pool but we enjoy the stroll and the scenery along the way. Being on the second floor allowed us to have the windows open at all times and not have to use the AC. Wonderful unit, setting and weather. Having stayed in 3D before we noticed the new HD cable boxes, WiFi modem and coffee pot. The unit was spotless and had everthing we needed. Since our last visit the Ocean Cub has added Taco Tuesdays and live entertainment on Sunday evenings. The tradewinds were blowing so we opened up the unit and turned off the AC almost daily; and had no rain at Hali'i Kai during our visit. We saw the changes to Kilauea due to the 2018 eruption, travelled to the newly created black sand beach at Isaac Hale Park and saw the lava flows from Fissure #8. A memorable experience. I am so happy to hear that you had a wonderful stay with us again! We constantly work towards guest satisfaction . We greatly appreciate your review as well. Trip from **** due to maintenance work on driveway/ no access. We are so sorry about the driveway access on the first day of your stay. Happy to hear the rest of your stay was beautiful and peaceful. We greatly appreciate your review as well. We enjoyed our stay in the condo. There were nice ocean and golf course views from the lani and master bedroom . Beds were comfortable and the kitchen nicely stocked- first time we have had a decent rice cooker! It was a bit of a walk to the pool, which is fine for adults/teens but might be difficult with little kids. However there were always spaces available in front of the pool complex while we were there. Unit was well stocked with DVDs and pool/beach equipment. We didn’t need to use them as we enjoyed wonderful golfing and sitting on the lani. Also enjoyed a few dinners at the restaurant at the pool. Great food, wonderful views, reasonable prices Love this complex and would rent the unit again. My husband and I are always delighted to hear from guests who stay in our condo. Glad to learn that you found the kitchen and activity closet to be well equipped. Several items (rice cooker, spice carousel, coffee bean grinder) were the result of suggestions by previous guests. We do take comments to heart. As you mentioned, the pool area does have visitor parking both in front and also nearby for those who prefer to drive, including handicap spaces. Hopefully you were able to view one of the spectacular sunsets while dining at the Ocean Club pool. The welcome mat is out for a return visit. Love this complex and the unit did have a nice view of the golf course and the ocean. Kitchen was well stocked and had a nice rice cooker which is unusual. Also lots of bathroom towels but could have used more kitchen towels. It is a bit of a walk to the pool, but those with small kids can drive as there was many parking spots available there. Restaurant/bar at the pool is fabulous. Great prime rib on Fridays. Aloha! Thank you so much for your review and for sharing your experience with us. We are so glad to hear you had everything you needed for a pleasant stay! It sounds like you were able to make use of the resort amenities and spend some fun time with the family! Mahalo for being such wonderful guests and we look forward to seeing you again soon!